In today’s healthcare environment, the ability to offer workers remote access to critical information is an integral part of the organization’s success. Like the internet, employees are used to gaining access to information quickly, on the go through their devices or computer browsers. Whether an employee is away from the office, working from home, on the road or at another facility, they can collaborate with one another remotely, share and discuss important information and access shared tools such as blogging, forms and workflows, policy management, online chats and forums to name few. What is a Healthcare Intranet Used For? Used as a general productivity tool within hospitals, clinics, long-term care facilities or ambulatory surgical centers. An Intranet site can be as simple as a few landing pages linked to an email system or as complex as connected databases, and websites with company information, on call calendars, class registration, contract and policy management, form builders, event calendars, news, document sharing/storage, video galleries, chat rooms, forums, and personal, detailed profile information. One of the main benefits of using an Intranet is ease of communication and improved collaboration and engagement between staff. Successful Intranets allow for unique customizations so that each employee can view information specific to their clinical department. A centralized search function allows for ease of access to information such as important news/announcements, policies and procedures, and other essential data, thereby allowing employees to get more work done and increase response time. As such, using an Intranet allows healthcare organizations to go paperless, a significant cost savings. You have two options when it comes to creating your own Intranet. You can build your own internally by using an IT staff member to develop and code the system or you can outsource this to a software vendor with an out-of-the-box solution. Healthcare organizations or hospitals with experienced IT and development management teams will find it easier and cheaper to build in-house, those without will find simplicity in outsourcing the project to an Intranet service provider. If you choose to outsource, keep in mind you’ll want to work with a company that offers healthcare specific Intranet solutions so you’re IT team isn’t tasked with creating functionality that suits your specialized needs. Whether you’re building or buying your Intranet solution, you’ll want to keep usability top of mind throughout the process. When creating an Intranet platform, it’s important to keep in mind that the central user of the Intranet will be an average, non-tech-savvy employee. The Intranet environment should facilitate and improve employee communication with simple features and page layouts that are easy to navigate; where a novice can easily locate the required information. Because the web-browser interface is something most individuals are already familiar with, the transition to an Intranet is relatively simple. 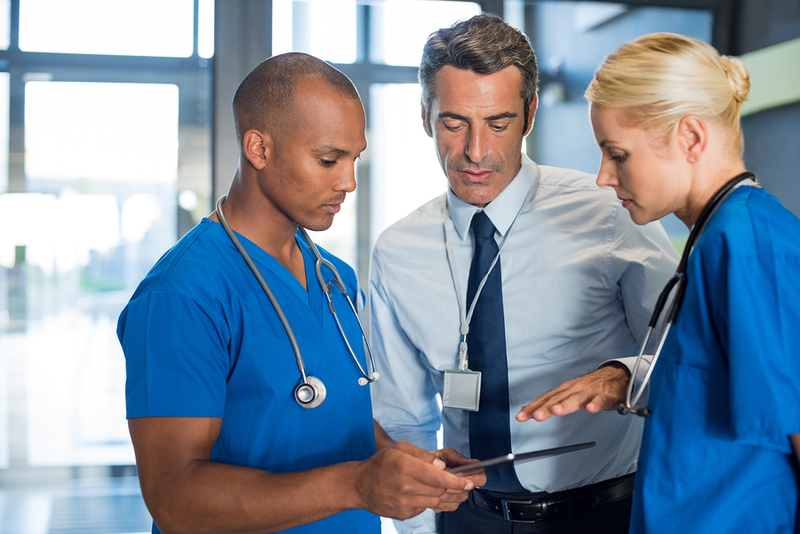 The end result is that your healthcare employees are able to perform their jobs more efficiently, thus allowing a business to improve workforce productivity, help facilitate collaboration and communication between workgroups or people, provide instant support on critical issues, and update information in real time. To create a successful Intranet platform…keep it simple. Intranet websites are different from traditional websites in that the main purpose of an Intranet site is to distribute and share information quickly. It is recommended that you match branding and organizational culture on your Intranet that your staff is used to seeing on your corporate website. Utilize colors that match your logo, but limit your graphic usage and keep the animation at a minimum. The simpler the design, the more the functionality can be highlighted so maximum productivity is achieved. An Intranet platform should utilize features, nomenclature and content that is familiar to your employees. The most basic Intranet site should include things like a high-quality built-in search engine, extensive help directory, FAQs, phone directory, and electronic forms as these are all things that have come to be expected both on internet and Intranet websites alike. In addition to standard communication tools such as blogs, chat rooms and forums are the types of social tools that are an inherent part of a good Intranet. Logically, the purpose of the Intranet is to close the communication gap, and chat rooms and forums provide the most cost-effective solution to closing that gap. Expecting your staff to review announcements sent via email is a thing of the past. Email transmission can often get lost and due to the increasing number of emails your staff might get within a day, they might not read get to the important information at the right time. In a report by the Nielsen Norman Group Report (The design and usability of best Intranet practices) one quality of a successful Intranet site is that it includes a CEO blog. While it may seem minor, an executive level blog does play an important role in employee morale and engagement, especially if said blog allows employees to post comments. In a hospital or healthcare organization with thousands of workers, being able to comment on the words a senior executive gives employees a sense of purpose and empowerment. What are your most important business outcomes? How can an Intranet be an invaluable resource in achieving these outcomes? Some goals can include improving staff engagement, productivity enhancement, streamlined decision making and customer service. The first step is to review the basic needs of users by communicating directly with people from various departments, and various department levels, to determine their needs and how the Intranet can resolve for those needs. This could be done by conducting a survey of employees and management to gain a better perspective on the top priorities of workers. The results of the survey will lead to the development of a project plan that includes the objectives and potential uses of the Intranet platform. From there you should evaluate different software vendors (if you are not building in-house) and engage your IT department (if you are building in-house) to gather their feedback as well. You will also want to develop an Intranet implementation team that will streamline your build process. Developing a good governance team to oversee the Intranet implementation and project deliverables can lead to its future success. This group will be responsible for developing the best practices for different departments within the organization. This group will also be the team that outlines and monitors policies, rules and feedback from their respective departmental users. Consider a team that includes C-suite staff as well as managers from marketing, IT, and HR. This governance group will also be able to identify owners of important actions such as content ownership, document version control, file modifications, editing of messages and publishing guidelines. The governance group will also be able to conduct regular surveys and calls for feedback to maintain and continually improve on the quality of your new Intranet as well. One of the most critical factors in setting up a successful Intranet site is getting user buy-in of the platform. Participation is not automatic and an adoption process that allows employees to familiarize themselves with the new technology is imperative. This can include training sessions, workshops, and communication from upper management. Clearly communicate the resources available and explain how you intend employees to use those resources. What do you plan to make available? Will your Intranet be a hub for documents, guidelines, office procedures, department information? Will it be a platform where employees can find industry content, and internal updates? Will it have other tools like employee messaging, or project management apps? Communicate what will be available to employees. It’s also important to stress the importance of the new Intranet site. How it will function with the daily operations of your organization. An internal marketing campaign directing employees to and enticing them to use the Intranet would be key to a successful launch. Creating a contest for naming the Intranet is another good way to get the staff involved and excited about the new system. At first glance, even an extremely organized and well-designed Intranet will look confusing and disorganized to a first-time user. Having a high-quality search engine and proper tagging of content will ease frustrations and make it easier for your employees to begin using the Intranet. Whether it be virtual, desktop training sessions, or in-person training sessions or even Town Hall meetings, having a basic introduction, and an opportunity for employees to ask questions and provide feedback will go a long way in the successful launch of your new Intranet. But try to break up the training sessions if you can, as a new Intranet platform can seem overwhelming at first. Make sure to include representatives from each department and identify your superusers so they can get trained and then train their own staff. In addition to a governance group, when building an Intranet site, it is always a good idea to have a dedicated support team on hand to help resolve any computer software or hardware issues. Utilizing one’s own IT department for this task – may often be possible. If you’ve licensed the product, your IT team might be responsible for minor issues, however, if you’ve purchased a SaaS delivery model, you can expect your software partner to assist you with troubleshooting technical issues. Adding an Intranet to your hospital or healthcare organization’s infrastructure has many benefits and is a wise investment in your employees and the future of your business. But an Intranet isn’t a short-term system – it’s an investment that your organization will give a significant amount of time to, so it’s essential you have a plan before beginning. Choosing the wrong product or approach could prove very costly but utilizing all of the steps we’ve talked about here will ensure that you enjoy the best results now and in the future. For more information about the HospitalPORTAL Intranet and Policy Manager, please contact us at sales@hospitalportal.net or review our product information here. Read Our Latest Blog Post – Why You Need a Policy Manager At Your Organization!